You might have heard that going without a meal or two a day does nothing but shut the metabolism down, causing your body to hang onto fat. Well, if this is what you believe, it’s time to have that myth shattered. New research supports not only that fasting helps people drop pounds but also generates valuable antioxidants that can help reverse some effects of aging. Wow, lose weight and look younger…. It’s not really that hard to adapt to a fasting lifestyle once you set your mind to it. There are a number of different types of fasting, with the most popular being intermittent fasting whereby you eat your last meal around 7 pm and don’t eat until 11 am the next day. The later you can push your first meal, narrowing your eating window, the more you push your body to a place where it starts to burn fat for fuel. Scientists from Okinawa Institute of Science and Technology Graduate University and Kyoto University found 30, previously unreported substances which increase during fasting bringing with them a number of health benefits. Researchers analyzed human blood, plasma and red blood cells drawn from fasting individuals and monitored changes in levels of metabolites – substances formed during the chemical processes that give organisms energy and let them grow. The results were staggering and revealed 44 metabolites, including 30 that have not been recognized before. These metabolites increased 1.5- 60 fold in just 58 hours after fasting. Previous research has shown that some metabolites decline with age including leucine, isoleucine, and ophthalmic acid. In fasting individuals, these metabolites increase which suggests that fasting could have an impact on longevity. When the human body is deprived of carbohydrates, it goes in search of energy stores elsewhere. This hunt for energy leaves a trail of metabolites or markers of energy substitution that accumulate during fasting. Two chemical substances that enhance metabolism, purine, and pyrimidine were also enhanced with fasting. These substances play a key role in gene expression and protein synthesis. 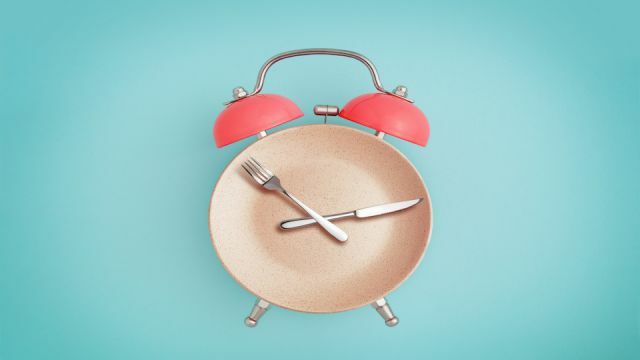 This suggests that fasting may reprogram which proteins cells build at what time – enhancing their function. This promotes balance in cells and edits their gene expression in response to environmental influences. Both purine and pyrimidine boost the body’s production of antioxidants when metabolized. A number of antioxidants were found to increase during the 58-hour fasting study period. This means greater protection for cells from the harmful impacts of oxidation and free radicals that promote aging. A 2013 review of studies on intermittent fasting in humans suggested that intermittent fasting has been shown to reduce inflammation, reduce blood pressure, improve metabolism, reduce LDL and total cholesterol levels, prevent or reverse type 2 diabetes, protect against cardiovascular disease and lead to significant amounts of weight loss. The first week, get used to only eating within a 10-hour window, between 9 a.m to 7 p.m for example, and not snacking or grazing outside of that. The second week, see if you can reduce your food intake to an 8-hour window, for example, between 11 a.m to 7 p.m. Some people eventually reduce even further to a 6-hour window, or to only eating every other day, but that’s something to experiment with once your body gets used to smaller changes in your eating schedule. It’s possible to experience significant weight loss and other benefits including possible anti-aging effects when you’re on the less extreme, 8-hour eating schedule. Hey Buddy!, I found this information for you: "Research Confirms Missing A Meal Helps You Drop Pounds and Reverse Signs of Aging". Here is the website link: https://www.thealternativedaily.com/missing-meal-helps-drop-pounds-reverse-signs-aging/. Thank you.